Christophe Piat’s training was akin to working in a prison camp: he did his time at Créteil Hospital in the demanding department run by Daniel Goutallier. Christophe was one of the pioneers who at a very early stage dedicated his practice to foot surgery exclusively, and he has a solid grounding in medicine and surgery, acquired from working alongside the most learned rheumatologists and radiologists at Lariboisière Hospital. 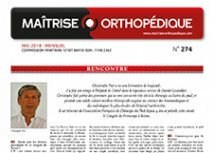 He has been treasurer of the Association Française de Chirurgie du Pied (AFCP - French Association of Foot Surgery) for the past 4 years and this year he will preside over their spring conference in Reims. 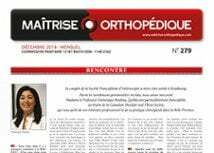 Lateral ankle sprains are the most common joint injury, the incidence being estimated as approaching 1/10,000 people per day: that is, about 6,000 sprains per day in France. Chronic lateral ankle instability is a common sequela, complicating between 5 and 20% of sprains. It carries a long-term progressive risk of arthrosis of the tibiotalar joint. When Wilhelm Conrad Roentgen discovered radiography in 1895, he wrote in his diary, ‘I have discovered something interesting, but I don’t know if my observations are correct’. He was doubly right. Two-dimensional radiography revolutionised medicine exactly one century ago, in that, formerly blind orthopaedic surgeons were finally able to open one single eye and marvel at the in vivo skeleton. Fixed percutaneous chevron osteotomy is a recent surgical technique for hallux valgus that has been described by several authors throughout the world using different terminology. There are a few differences between published osteotomy techniques; however, all of the proposed fixation methods are technically challenging and expose the surgical team to numerous fluoroscopic checks. Hallux varus is a well-known complication of bunion surgery that can occur regardless of the technique used, whether it be osteotomy or tendon transfer. This is a cause of dissatisfaction for surgeons and patients alike. Long periods, even several years, may pass between the initial surgery and when the surgeon needs to reoperate. I like its line, I like the definition of its shape, I like its perfect curve. I like Georges Goursat, the great artist known as Sem, whose illustrations – spanning from 1900 to 1930 – cannot be rivalled. In my home, his charcoal drawings – gleaned from auction rooms and bookshops – adorn the walls and fill box after box.